Escape those deadly flames with this life-saving poncho! The FireFly™ Survival Poncho provides protection from the intense heat and flames of a fire so you can quickly move to safety without harming yourself. Oversized ponchos slip on easily and offer plenty of room inside for children or pets. 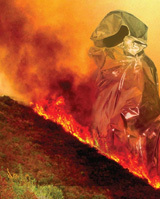 Aluminized fiberglass construction resists heat up to 1650 degrees F.
The FireFly Survival Poncho provides the wearer the vital minutes to escape from a burning building with the ability to walk through flames and high temperatures. Available for personal and commercial use. Comes in a special compact briefcase that is convenient to carry or store within reach. Empowers escape from danger to safety when threatened by flames and high temperatures. Is easy to wear, flexible and readily accessible in case of emergency. Can save lives in case of an emergency by providing the vital time needed to escape. Sizes available for adults and children. These products are Currently Not Available - updates coming soon. For more information, contact us via e-mail at info@technonllc.com or telephone at (954) 364-7516.